AGE of TV HEROES is FINALLY HERE! Our copies of AGE OF TV HEROES just arrived from our printer late today (Wednesday), and we’ll be shipping them out over the next two days. If you preordered from us, look for yours in the mail soon. If you haven’t yet ordered it, you can go to http://twomorrows.com/index.php?main_page=product_info&products_id=741 and place your order now, and save 15% off the cover price! 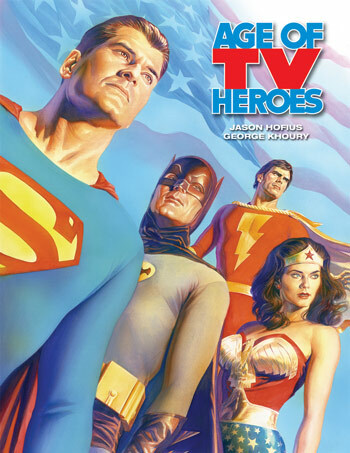 Age of TV Heroes examines the history of the live-action television adventures of everyone’s favorite comic book heroes! This handsome full-color hardcover features the in-depth stories of the actors and behind-the-scene players that made the classic super-hero television programs we all grew up with. From legendary shows like The Adventures of Superman and Batman, to the modern era of The Tick and Smallville, it’s colorfully presented in vivid detail, lavishly designed with a bevy of color photographs. Included are new and exclusive interviews and commentary from Adam West (Batman), Lynda Carter (Wonder Woman), Patrick Warburton (The Tick), Nicholas Hammond (Spider-Man), William Katt (The Greatest American Hero), Jack Larson (The Adventures of Superman), John Wesley Shipp (The Flash), Jackson Bostwick (Shazam! ), and many more, including comments from Reb Brown, Stephen J. Cannell, Chip Kidd, Stan Lee, Noel Neill, John Romita, Alex Ross, Ilya Salkind, Lou Scheimer, Lorenzo Semple, Lyle Waggoner, and other actors, producers, and crew. Re-experience the pop culture birth of the super-hero phenomenon, and relive the first time that these heroes came to life on TV! Written by Jason Hofius and George Khoury, with a new cover by superstar painter Alex Ross! Thanks one last time for your continued patience on this book; it’s been a long wait for some of you, but the book is gorgeous, and I’m confident you’re going to love it! This entry was posted in TNT on 31 March 2010 by Mr. Morrow. The AGE has arrived! See it now! AGE OF TV HEROES finally ships March 24! Yes, I know we’ve announced the release of this book something like 138 times since the original announcement back in 2006. Yes, at least one of the TV stars interviewed for the book has sadly passed away since then, never to see it in print. But all that embarrassment aside, this is one friggin’ awesome full-color hardcover book, and it’s FINALLY ON PRESS! No really, believe it! All the legal hassles are cleared! Authors George Khoury and Jason Hofius have started dancing an Irish jig! And this puppy will be heading to stores and customers’ mailboxes by the end of this month. Still don’t trust me? Check out the exclusive 12-page PDF Preview of the book here! This entry was posted in TNT on 15 March 2010 by Mr. Morrow. Where, oh where, has my pub-lish-er gone? But wait, there’s more! If you order by midnight tonight (and even if you don’t), we’ll be frantically working to get these extra items in the mail, all week long! What’s that you say? Why is Volume 22 of the Modern Masters series appearing AFTER Volume 24? And what pray tell happened to Volume 23? Some things were meant to be kept a secret from mere mortals, my friend. Fortunately, this ain’t one of them. See, each of the Modern Masters artists have different schedules, and we work around them as best we can, and still try to keep the series coming out in numerical order. Once in a while, things don’t go as planned, so Bucky’s volume ran a bit later than planned. Guy Davis’ is actually pretty much right on time. And unfortunately, due to scheduling conflicts with Darwyn Cooke, we’ve been unable to complete Volume 23 as planned, so we’re having to reschedule it. We hope to have a new release date for the book shortly, so please stay tuned to our website, and thanks for your patience.